Join the discussion on our forums! 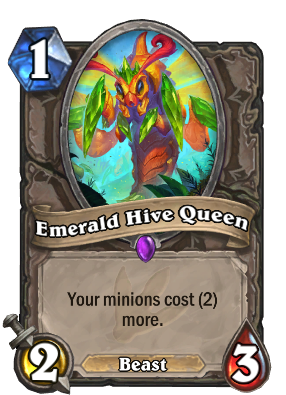 Come discuss Emerald Hive Queen over in our dedicated Emerald Hive Queen discussion topic. Your minions cost (2) more. She rules the emerald hive at the end of the yellow brick trail. this card doesnt deserve to be epic. its pretty bad in arena too. even duskboar and backstreet leper seems better to me. Did you just call Enchanted Raven worse than this card? I got one of these and don't really get how this can be effective in any deck build with the cards currently available. If you think this is new Zombie Chou, you are wrong, this card is complete sh`t in arena. Zombie Chou gives you good trade on turn 1 and 2, healing you opponent doesn't matter that much, and you could play a 2 drop even Zombie Chou is still there. This PoS, if it stay alive, your turn 2 will most probably hero power, how many 2 mana spell you could get in arena? I ran into people playing this on turn 1 in arena, I let it live as long as I can, I win all those games. If you don't believe me, try it yourselves. Seems like it would be a good 1-drop for control warrior maybe? Maybe even something like Maly Rogue, since it can be held as a combo activator later. What a piece of garbage. Mana Wyrm has the same stats after casting a single spell, without the crippling downside. Just pulled a golden one. Yep, put bad cards into your deck, so that Hemet can burn them. A recipe for countless victories, no doubt. THIS CARD IS SO BAD!!!! I REGRET DRAFTING IT EVERY SINGLE TIME!!! DO NOT DRAFT IN ARENA NO MATTER WHAT HEARTHARENA SAYS!!! It'll go pretty well into any spell heavy deck. Guess a worthy candidate for "buff" Paladin. Since there are early low cost buffs that could tempo out your opponent. This would be worthy because of it's health. It would survive turn one in most cases. That makes the +1/+2 Paladin buff viable as well. Can't wait for the moment when someone tries playing 2 of these on turn 1. Dem Memes! I though so too but despite having a lot of buffs this deck will have a lot of minions aswell so i dont think its a good minion for paladin to have. Guess it will be good in hard control decks. Or maybe in druid in place of living roots.